This Chancellor home in Auckland is nothing short of breathtaking. Built to weather the elements, this home promises to serve future generations with style. An eye for craftsmanship and detail is evident at every turn. The stylishly designed three level home offers quality and luxury living at its best. The single-level stylish modern designed house with 265 square meters floor areas located in the prestigious suburb of Kingseat, engaged a section area of 2503 square meters. I AM DIFFERENT!! SPACIOUS SIX BEDROOM HOME WITH WIDE PANORAMIC VIEWS BUILT BY REPUTED CHANCELLOR BUILDERS. 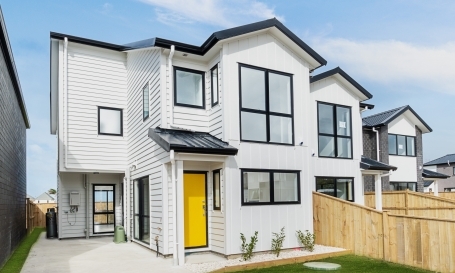 The perfect location for a first home buyer or a young family, who would love the opportunity to live on the flat land of desirable Hobsonville. Nestled amongst other new homes in Scott Point subdivision these terrace town houses are unique. Located in Milano Heights, this is a Chancellor SPEC Home that offers comfortable and smart lifestyle. The Home comprises of 6 bedrooms, 4.5 bathrooms and 1 double garage. The high quality design, construction materials give a modern, stylish edge to a very liveable open plan home. Plenty of glass windows invite in ample natural light and warmth into every corner of the spacious living, kitchen and dining areas. Presenting to you is this standalone and architecturally designed 4 bedroom and 2.5 bathroom home built for first home owners, in the ever-growing area of Takanini.